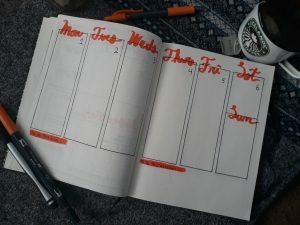 Allowing for creativity, each month of a bullet journal can have a new theme and color scheme. Photo by Ainsley Davis. Colorful pages, loopy cursive, and neat, organized to-do lists; a bullet journal is a customizable planner that can be used to organize assignments, keep track of daily habits, and show one’s creative side. 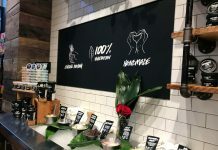 Since they are entirely do-it-yourself, each one is unique and can be tailored to a person’s specific goals using the materials they have. The most important material is a notebook. Ideally, a bullet journal should have dotted pages and thick paper, so that ink will not bleed through, but any notebook will do. Amazon, Staples, Target, and Walmart are all places to find notebooks. Sakura Micron pens and Tombow brush pens are popular materials, but Sharpie pens and Bic highlighters are more affordable options. 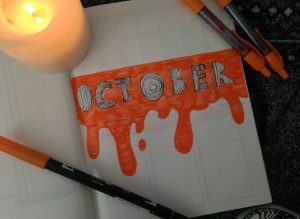 A monthly spread can lay out plans for the month and help students set goals. You can start with a calendar on the left page, leaving space for goals, important dates, and things to look forward to below it. The right page includes a list of favorite songs from the month, a space for breaking down tasks, and and a space for listing assignments. Breaking down tasks into smaller steps makes them less overwhelming and ensures you don’t miss any important details. It’s easy to forget projects and assignments, especially when the deadline is far away, so creating a list of all the work due in a month can be beneficial. Habit trackers help busy students keep up with things like studying, exercise, or practicing an instrument. Each habit has a mini calendar, and each day you complete a habit, you color in a square. Coloring in the boxes creates a feeling of accomplishment and shows which habits you need to spend more time on. Habit trackers also remind you to keep up with these tasks. 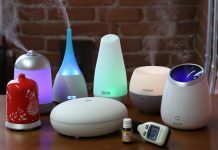 Next to the habit tracker is a sleep tracker. Each day, you can use the graph to record how many hours you sleep. These kinds of trackers can instill healthier habits or help you recognize when you’re pushing yourself too hard and neglecting physical needs like sleep, hygiene, or food. 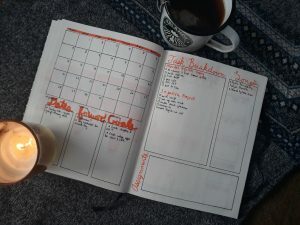 This spread is set up like a planner, with boxes for each day to write down events and due dates. You can include a weekly to-do list and a weekend to-do list, but the extra space can also be used for other things such as a gratitude log, food or exercise log, or even a weekly inspirational quote. Additionally, you can make weekly versions of the habit trackers or the task breakdown from the monthly spread. 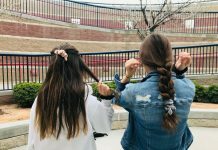 With all the class codes, passwords, and teachers’ email addresses, it’s easy to get overwhelmed or forget important information. An info page serves as a reference and is easily accessible throughout the year. Some goals such as writing a book, losing weight, or learning a language are easier with a long-term plan. With a bullet journal, students can create a visual timeline for their projects and keep track of their progress. 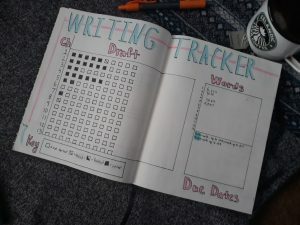 To see my own writing progress, I created a writing tracker. On the left side is a record of completed chapters, with different types of boxes depending on the stage of completion. The key at the bottom of the page explains this system. On the right side are spaces for word counts and dates I set for myself. Bullet journals have unlimited potential and can be as simple or as creative as desired. 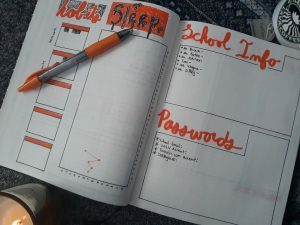 Some students find that creating their own planner motivates them to stay more organized than simply buying a planner. Although these five ideas are a start, there are thousands of other ideas online, and experimenting on your own can generate even more ideas. Next articleWhat is your weird sports superstition?